Yesterday afternoon, along with over a thousand other people, I turned up at a community centre in Birmingham to watch Jeremy Corbyn on the campaign stump in his bid to become leader of the Labour Party. But even as I write that sentence I know it is misleading. Corbyn is not campaigning to become leader of the Labour Party. He said nothing about his plans were he to become Leader of the Opposition. He scarcely used the personal pronoun unless he was talking about his constituency. The campaign was little to do with Corbyn, and everything to do with the Labour Party and its role and purpose in British political life. That is the key truth that Corbyn has understood, and which his opponents simply cannot see. They are, in this instance, the ones with the problem. For is Labour a mass party, a movement, or is it a technocratic bloc awaiting its turn to govern? Those are the poles in this argument, but only one is doomed to fail. And it is the latter. The Tories are a political cabal interested only in power who acquired a mass party when that became useful. The Labour Party is a mass movement which acquired a parliamentary leadership when that become necessary. These differences are in the DNA of the parties and represent a fundamental difference: one was created by a democratic movement, and the other is a clique with an imperative to rule. But this is abstract stuff, however important. For what is going on right now? John Harris in the Guardian suggested that the atmosphere at some Corbyn meetings was akin to the Scotish independence debate, youthful and exciting. David Hencke in his excellent blog wrote of the way in which a sort of inchoate yearning in the most unlikely parts of middle England were finding expression through Corbyn’s campaign. The writer Sibyl Ruth, who was there yesterday, described Corbyn as having the quality of decency, and I think that’s an important insight. There is a deeply moral strain in Britain which is troubled by the lack of compassion of many Tory policies, and the downright cruelty with which they are implemented. Corbyn gives pained expression to that, and it is necessary that the people most affected by cuts have a louder voice in the political arena. 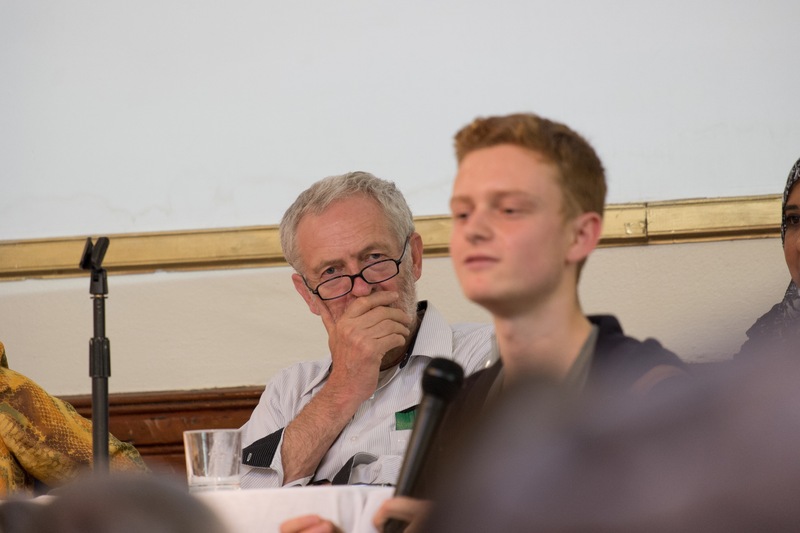 I went along yesterday less to see Corbyn, than to see the crowd, and to feel its reactions. We arrived early (which enabled us to sit in the hall, not the overflow space). All around conversations conveyed a kind of collective surprise at people finding themselves in a packed political meeting on a sunny Sunday afternoon in August. Behind me a group of teachers with educated Brummie accents (think the tones of ex-Lib Dem MP Lorely Burt) were discussing their scepticism about Corbyn’s chances of becoming leader, and whether he’d be any good as Prime Minister. Yet the teachers’ cheers were ear splitting when he began to speak about education. That dualism – internalising years of there being only one ‘realistic’ political wisdom, yet a feeling that it isn’t right – was palpable throughout the hall. For this was no rentamob. Nor was it yet an alliance. A few rows away from me, some older men with the Brahmin faces of Marxists from the Indian Workers Association sat on their hands rather than applaud when young Muslims spoke about the intolerability of being the central focus of the surveillance state. An elderly white couple left at that point. I assumed that the latter were uncomfortable at the reminder of whose community centre they were in, whilst the IWA guys were probably tutting about communalism. Different political motivations entirely, I’d guess, though both probably psychologically telling. One of the most interesting audience responses came on the question of Scotland. 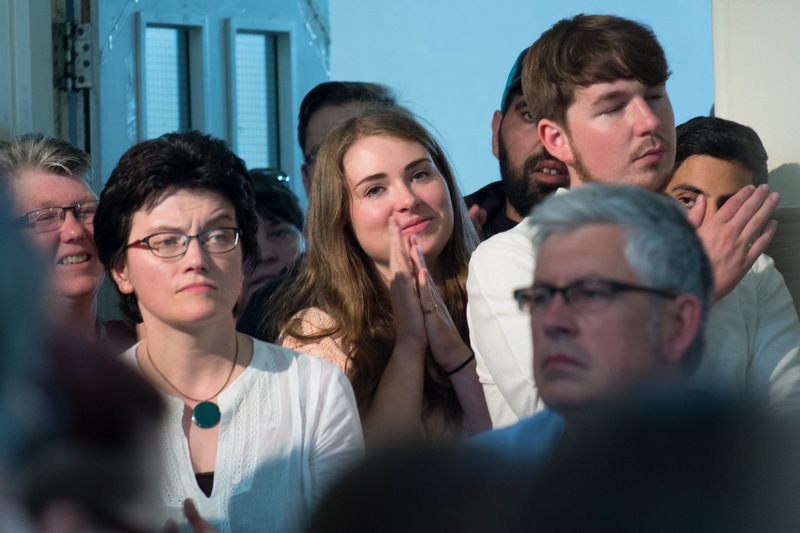 Someone in the audience asked a question about how Corbyn would win Scotland back for Labour. Corbyn was at pains not to diss either the SNP or the Scottish people. But the throwaway line that got hearty spontaneous applause was his discomfort with the flag as a political rallying point. 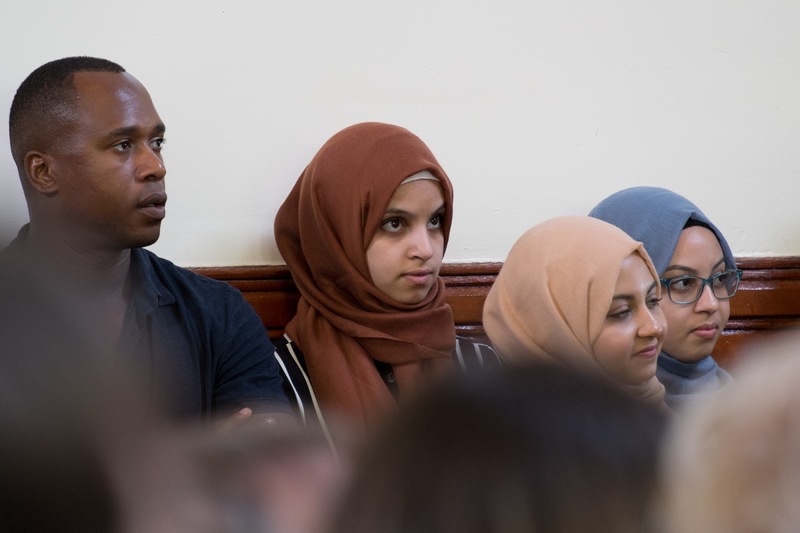 A multiracial audience in the middle of England instinctively distrusts national symbols, instinctively feeling them to be divisive and crude. One young man, Luke, pictured below, spoke from the heart about his complete love for his city and its diverse people. Civic virtues we get – but ‘civic nationalism’ makes no sense. Corbyn did not attack any of his opponents, but they have continued to lay into him. Chris Leslie’s despair at Corbyn’s economic policies is genuine, I’m sure. He speaks with the angst of a man who has gone into boardrooms with Ed Balls and Chuka Ummuna and been treated as kids. I feel his pain. But getting cross with his colleagues is no help. The economics of ‘austerity’ isn’t the only way, and it is time to say that with conviction. Neil Kinnock’s diatribe against Trots and entryists is the least important blow against Corbyn. I rate Neil Kinnock as a brave and successful party leader who would have been an excellent Prime Minister, because he wasn’t afraid of the talents of others. But he was bruised, as was the Labour Party in the 80s, by the Militant Tendency, and ever since has seen Trots everywhere. Kinnock’s biggest mistake as leader was cracking down on Black Sections, seeing them as a Militant plot, when they were actually Militant’s greatest foe. Black Sections represented a moment when the politics of secular unity might have prevented the isolation and ethnicism of minorities, with the results we see today. So what if Corbyn won? The newspapers would put a battalion of grubby hacks on the case, seeking dirt where they can find it, and inventing it where they can’t. Corbin’s lack of aggression would see Cameron walk all over him at PMQs. The bitter ranks of the spadocracy would take on the Militant role and eat away at his authority from within. It would be ugly. And what if he doesn’t win? Will all those new young members and supporters stay with Labour and rebuild it, giving their loyalty to Yvette, or Andy or Liz? I doubt it. Will the newspapers treat the new, non-Corbyn leader kindly and fairly? No way. Will the voters of Nuneaton, and Thanet, and Glasgow return to ‘New’ Labour? Don’t bet on it. You don’t win an election unless you win the argument. So it comes down to this: how are the unheard voices, and the unmet needs, and the distant dreams of the many to find hope in politics? By politics as usual, or by something else? And does Jeremy Corbyn have a route map to ‘something else’? I don’t know the answer to that. But I do know that the pressures he has tapped into through this campaign won’t go away. One day they will find new political expression – and it will change everything.